How Niema Stone transformed a hobby into a business. 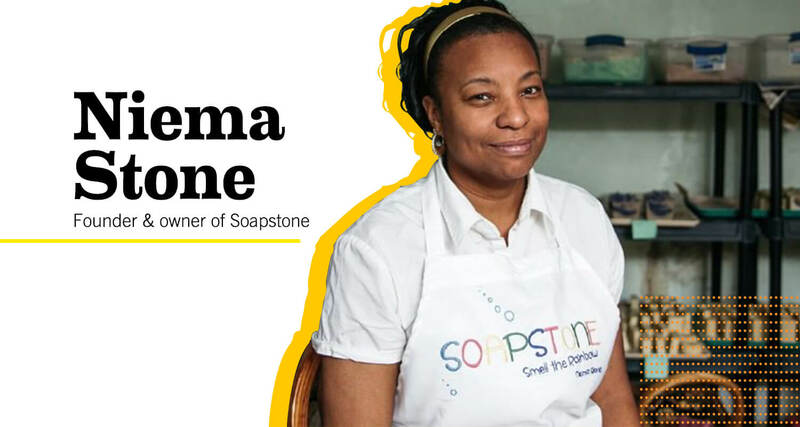 Niema Stone stumbled onto the art of soap making nearly 10 years ago while seeking a natural remedy for her husband’s skin condition. “When my husband and I were dating, he suffered—and still suffers—from eczema. I was intrigued with experimenting with natural products—things that would be healthy for the body,” said Stone, a Detroit native who has worked as an elementary school teacher for 20 years. She began to research what products could help soothe her husband’s sensitive skin. With a loving push from her husband, Stone transitioned her hobby into a business, launching Soapstone Soaps LLC in 2014. Having mastered the craft of soapmaking, Stone now had to educate herself on the basics of being a business owner. “That’s still a work in progress,” she said. She sought out programs that could help her and discovered Southwest Solutions’ ProsperUS Detroit small business training program – citing its affordability and the convenience of attending workshops in Rosedale Park, the Detroit neighborhood where she lives. She graduated the program in January 2018. “I think they did a good job, but I really needed one-on-one coaching,” she said. ProsperUS Detroit is an economic development strategy designed to empower low- and moderate-income people through place-based, culturally competent services that help them start and grow businesses. In 2018, NEI made a grant of $145,000 to Southwest Economic Solutions in support of ProsperUS Detroit’s programs serving neighborhood entrepreneurs in Detroit. She took advantage of ongoing mentorship ProsperUS offers program graduates to help them access affordable resources and identify their individual business needs. For Stone, that included developing a marketing strategy to increase awareness of her brand and build a stronger customer base. “I’m excited about where my business is going,” she said. When she started, she was just experimenting in her kitchen. Now, she produces more than 20 varieties of soap, such as Lemon Lime, Coffee, and Confetti, (a fun blend of end pieces from various batches), in a dedicated room she and her husband transformed into a lab to support the business’s growth. Her all-natural creations are now available in eight stores across southeast Michigan. Last year, Stone was awarded $10,000 by the New Economy Initiative through its NEIdeas Small Business Challenge. She had applied the year before and didn’t win, so she was surprised when she got the call. She credits her success in part to working with Grandmont Rosedale Development Corporation, the NEIdeas ambassador assigned to her neighborhood, whose representative encouraged her to explain her vision for growing her business in more detail. Stone’s business is not yet profitable, but she’s working to change that by deepening her industry knowledge. In May, she plans to attend the 2019 Handcrafted Soap & Cosmetic Guild Conference in Dallas, Texas. “You learn the latest trends from people who have businesses that have been very lucrative,” she said. She will pay to attend the conference with funds she received from NEIdeas.